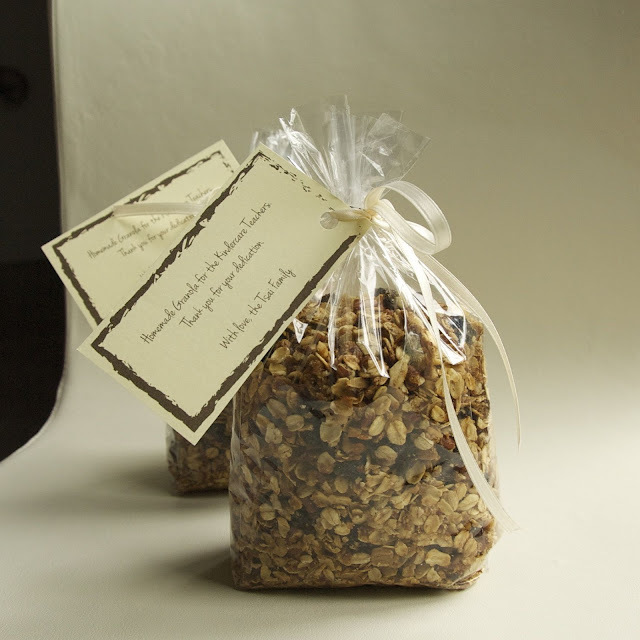 To kick off teacher appreciation week, I brought in some homemade granola for the teachers at Austin's daycare. I'm so glad I did because I saw that other parents had brought doughnuts and other sugary sweets. I'm sure the teachers were happy to see something healthier on the table. To add a special note, I printed a short message on some cardstock and tied it on with some ribbons. Voila! Mix oats, nuts, brown sugar, and salt in a large bowl. Mix honey, maple syrup, and oil together. Then combine the oil mixture with oat mixture. Stir until well combined. Bake for 1 hour and 15 minutes, stirring every 15 minutes. Remove granola from oven and transfer to a large bowl. Add the raisins.